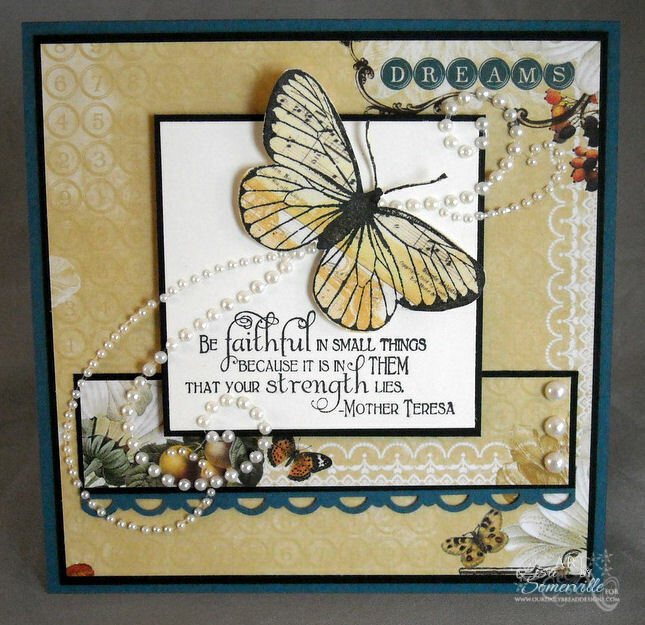 The pattern paper on the base card and small panel are from Websters Pages, the Butterfly is stamped on a piece of 7 Gypsies paper, then cut with the Butterfly Die. After cutting, I did go in and fussy cut to get a tad closer to the image. Isn't the script on the sentiment just beautiful! Beautiful card and sentiment too! sa-weet GF! Fabulous! Love what you did with the papers. The butterfly is beautiful on the pp! Beautiful design! I love all the hints of lacey border! Oh I just l-o-v-e this card! It's a beauty complete w/pearlie-pearls! This is beautiful Lisa!! I just love your coloring of the butterfly and your colors. Gorgeous take on the sketch!! Thanks for joining the ODBD Shining the Light challenge this week.